Acappella version of Force of the Forest. Thank you so much to all this singers who gave their voices to support this manifestation of our love in voice and action: Lua Maria, Reuben Darling Khan, Jasmin Clark, Joseph Rose, Ayla Schafer, Helen Knight, Benjamin Clark, Eliza Kenyon, Ya'Acov Darling Khan ALL of the proceeds from this song go to the Pachamama Alliance to anchor this prayer in action. Let us stand together. 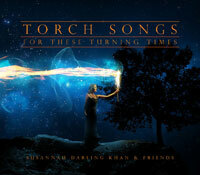 Ya'Acov says: "I am so proud to announce the release of Susannah’s latest album – Torch Songs: For these Turning Times. This album is a powerful invocation for us all to take courage and stand up for life on earth. Each song is a jewel. I love the musicality, the message and the magnificent medicine that this new album is offering into the world at a time when we all need to dance like dervishes and raise our voices for what we care for. These songs come from such a deep place, a medicine place, tender and wise and full of love and with this offering, Susannah is taking her place in the circle of Medicine Women, a circle whose voices need to be heard.” Ya’Acov Darling Khan. December 2016 Enjoy!